This remarkable work offers a fresh approach to a freedom that is often taken for granted in the United States, yet is one of the strongest and proudest elements of American culture: religious freedom. In this compellingly written, distinctively personal book, Judge John T. Noonan asserts that freedom of religion, as James Madison conceived it, is an American invention previously unknown to any nation on earth. 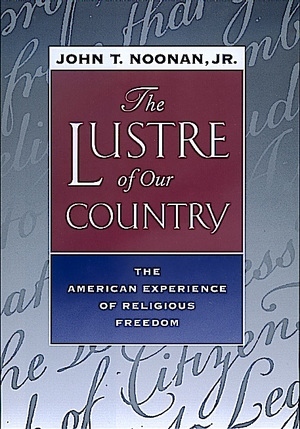 The Lustre of Our Country demonstrates how the idea of religious liberty is central to the American experience and to American influence around the world. Noonan's original book is a history of the idea of religious liberty and its relationship with the law. He begins with an intellectual autobiography, describing his own religious and legal training. After setting the stage with autobiography, Noonan turns to history, with each chapter written in a new voice. One chapter takes the form of a catechism (questions and answers), presenting the history of the idea of religious freedom in Christianity and the American colonies. Another chapter on James Madison argues that Madison's support of religious freedom was not purely secular but rather the outcome of his own religious beliefs. A fictional sister of Alexis de Toqueville writes, contrary to her brother's work, that the U.S. government is very closely tied to religion. Other chapters offer straightforward considerations of constitutional law. Throughout the book, Noonan shows how the free exercise of religion led to profound changes in American law—he discusses abolition, temperance, and civil rights—and how the legal notion of religious liberty influenced revolutionary France, Japan, and Russia, as well as the Catholic Church during Vatican II. 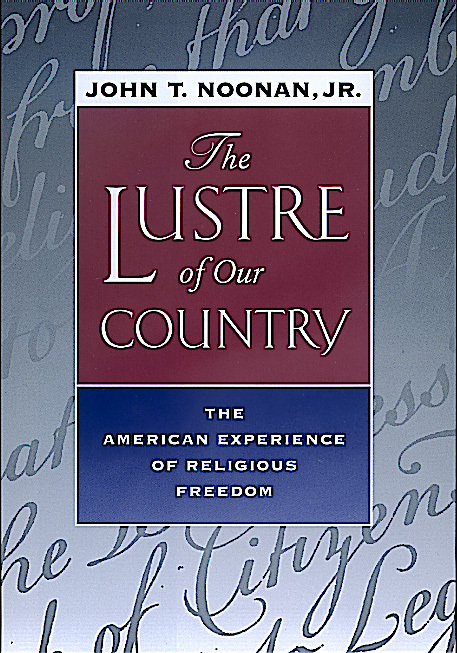 The Lustre of Our Country is a celebration of religious freedom—a personal and profound statement on what the author considers America's greatest moral contribution to the world. John T. Noonan Jr. has served as Judge on the United States Circuit Court of Appeals for the Ninth Circuit since 1986. He is Robbins Professor Emeritus at Boalt School of Law at the University of California, Berkeley, and the author of prize-winning work in history, philosophy, and theology. His books include Bribes (California, 1988) and The Antelope: The Ordeal of the Recaptured Africans in the Administrations of James Monroe and John Quincy Adams (California, 1977).